These minutes were just sent by Secretary, Sherry Vogel from the February 24th Key Leader Meeting. If you missed the meeting, read through the minutes to catch-up on key leader business. 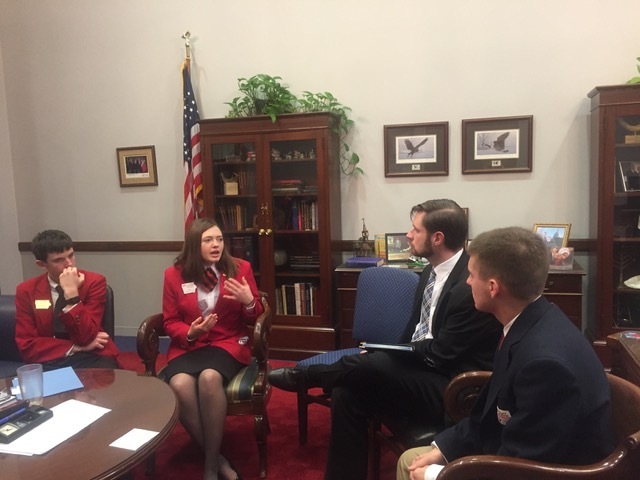 IFCSE is proud to support FCCLA students and advisers as they advocate for FCS, FCCLA, and CTE education at the National Policy Seminar (NPS) in Washington D.C. This year Isabelle Warner and her adviser, Kristin Rockhill, from West Lyon High School attend NPS. Read the article below, published in the West Lyon Herold, to read more about Isabelle’s experience. In order to convince another person of something, one must first have a strong belief in the cause. 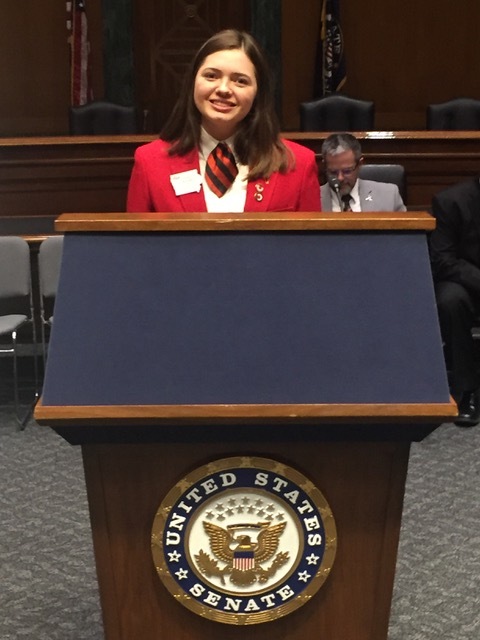 For Isabelle Warner, a junior at West Lyon High School, her testament of how career and technical education have impacted her life took her to the Capitol Hill in Washington D.C to lobby for her cause. “Overall, her job was to advocate for family and consumer sciences and to make people aware of the changes happening in that area of education,” said Rockhill. “We’re trying very hard to become more industry-based and a lot of the older legislators think of “home ec” and “Future Homemakers of America” and think of baking cookies. We’re more than that,” said said. “It’s really important with funding that we tell lawmakers we’re working to get students directly into careers in these industries that need people to fill positions,” explained Rockhill. Family and consumer sciences education focus on careers such as those in the hospitality and tourism industries. “Anything from positions in restaurants to the airlines and the hotel/motel industry,” said Rockhill. IFCSE Educator of the Year (maximum of 2 per year)—An individual who is currently employed in a middle school or high school FCS program in Iowa is eligible. This individual has promoted FCS education in her (his) community and in the state. Their FCS program shows balance in all areas of FCS and promotes family life in the school and in the community. Their contributions and achievements exemplify the goals of IFCSE. This individual must be a current IFCSE member. 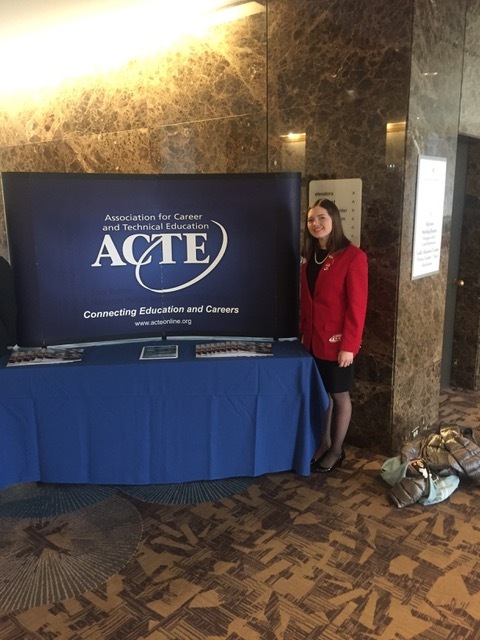 Award winners will be eligible for IACTE Award given at the annual conference. IFCSE Outstanding New Educator—An individual who is currently employed in a middle school or high school FCS program in Iowa is eligible. Nominees must have taught for a minimum of three but not more than five years, but the applicant may be in their sixth year of teaching at the time of application. Award winners will be eligible for IACTE Award given at the annual conference. IFCSE Student of the Year—An outstanding high school or college student interested in FCS education career. Student need to have shown a commitment to FCS through exemplary actions or enrollment in an FCS education degree. IFCSE Friends Award—Outstanding individual who has promoted the goals of FCS education in their locality. This could include, but not be limited to principals, school board members, guidance counselor, parents of students, advisory committee members, teachers other than current FCS teachers, etc. IFCSE Lifetime Achievement Award—This award recognizes the contributions and distinguished accomplishments of members who have been identified with the work and purposes of IFCSE or Career and Technical Education over an extended period of time. Award winners will be eligible for IACTE Award given at the annual conference. Submitting Applications: Questions contact Past President Kelsie Engelken at kengelken@colo-nesco.k12.ia.us. Please submit nominations by May 14, 2018 to kengelken@colo-nesco.k12.ia.us. To complete the application, use the link below to make a copy of the document to be able to type on it. Breakout with Family and Consumer Sciences at the 2018 Iowa Family and Consumer Sciences Educators Annual Conference Sunday, August 5th- Tuesday, August, 7th. The Conference is co-sponsored by the IFCSE and the Iowa Department of Education. Learn how to engage student learning through creating and implementing breakout boxes into various FCS content areas. Choose from over 20 breakout sessions. Participate in FCS content specific professional development. Network with other FCS educators. Learn ways to implement or enhance FCCLA in your classroom and school. Explore the Ames area with Human Services and FCS connected educational tours. Earn one graduate credit hour pending course approval from Viterbo University. Save the date! The next key leader meeting will be on Saturday, February 24th at ISU in the Palmer building from approximately 9:00am-noon. We hope to see all of the key leaders at the meeting! If you missed the key leader meeting on Saturday, October 7th, you can get caught up by reading the minutes from Secretary, Sherry Vogel! Click the link below to find the 2017-2018 IFCSE Membership form.